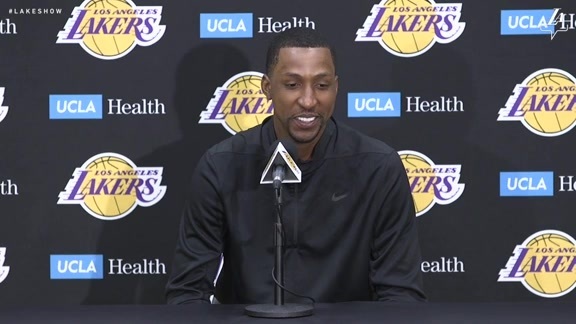 EL SEGUNDO – The Los Angeles Lakers have re-signed guard Kentavious Caldwell-Pope, it was announced today by General Manager Rob Pelinka. Per team policy, terms of the deal were not released. In 74 games (all starts) for the Lakers last season, Caldwell-Pope averaged 13.4 points, 5.2 rebounds, 2.2 assists and 1.4 steals in 33.2 minutes per game, while tallying career highs in field goal percentage (.426) and three-point percentage (.383). The five-year NBA veteran has appeared in 388 career games (348 starts) for the Lakers and Detroit Pistons, holding career averages of 12.0 points, 3.4 rebounds, 2.2 assists and 1.4 steals in 30.8 minutes. He is also one of 22 players in league history to convert at least 635 three-pointers in his first five professional seasons (638).